This trip through Mississippi had a lot of challenges. 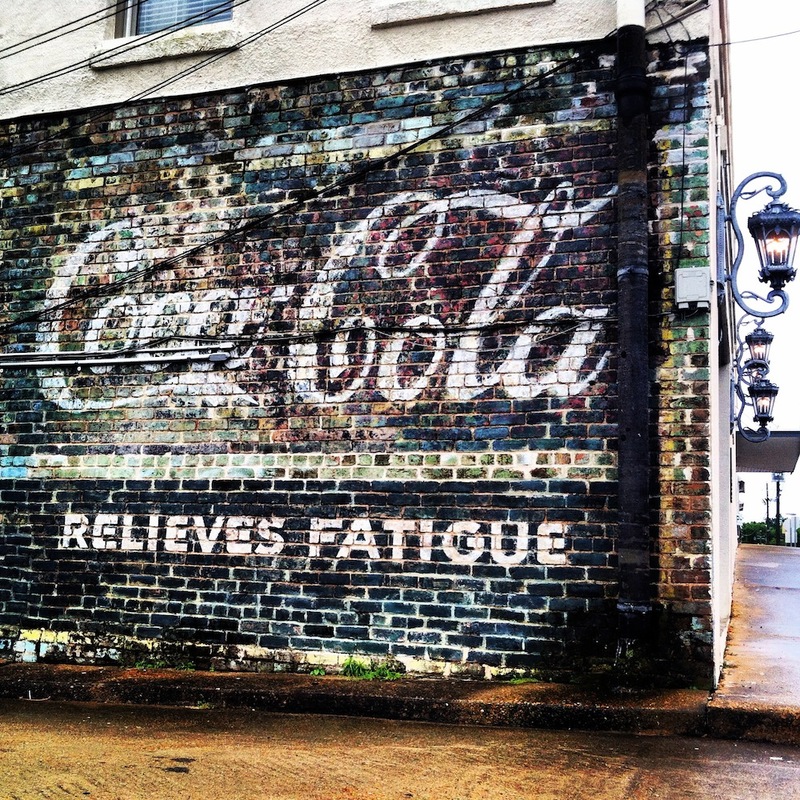 Missing candidates, late schedules and zealous handlers can make it tough to get informative and creative images, and this swing through the Magnolia State might have generated more stories than art. I was looking forward to covering Senate candidate Chris McDaniel because his campaign events sounded promising. 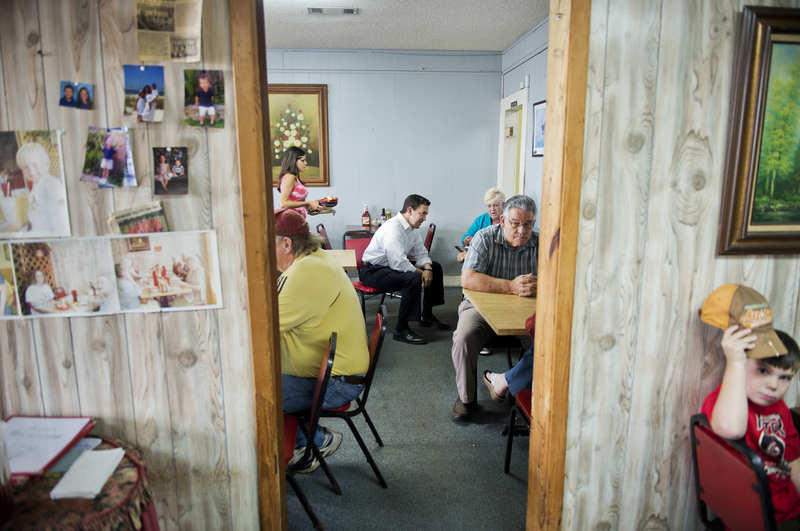 We arrived bright and early in Philadelphia, Miss., at gas station/diner for a sit down with some locals at 7 a.m. While we were waiting, my colleague Kyle Trygstad interviewed a friendly gentleman (almost everyone I met was friendly) who told us the campaign had informed the locals that McDaniel wouldn’t be coming. So we moved on for the next scheduled event, at an equipment auction outside of town. With the visuals of excavators, bulldozers and people bidding, I thought this had the potential to illustrate a campaign in the rural South. Soon we saw a McDaniel volunteer, who informed us that the candidate wouldn’t be attending this event either. Apparently, there was something wrong with the bus. The two cancellations didn’t help me, but it did make a really good story for Kyle . We headed to Union for what was scheduled as a “rally.” In reality, the McDaniel campaign was just stopping to get gas and say “hi” to whoever was there. 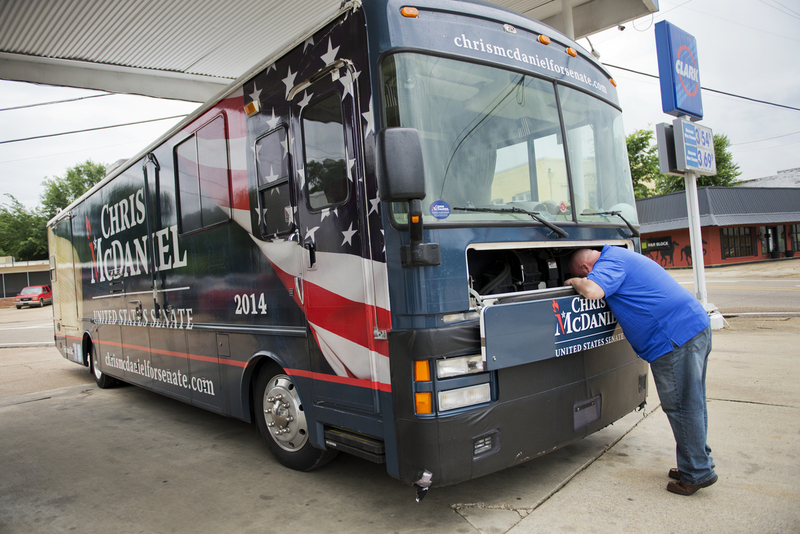 Before McDaniel got off the bus, his driver briefly worked under the hood – finally a picture for me! It definitely illustrated the story of the day. I stood around hoping McDaniel would fill up the tank because that would be a genuine photo. Unfortunately, no one put gas in the bus and it just drove away. We then drove to Jean’s Restaurant in the town of Meridian. The restaurant is family owned and has been there for more than 50 years. The owners and patrons were super cool with me running around and taking pictures. McDaniel’s staff was introducing him to patrons and staying close to him, so I couldn’t use a lot of the actual greeting photos because the frame was too busy with handlers. When he sat down, the staff cleared out and I got my traditional diner shots. Although most candidates do it, I still love these diner scenes because I grew up in places like these in rural Pennsylvania. 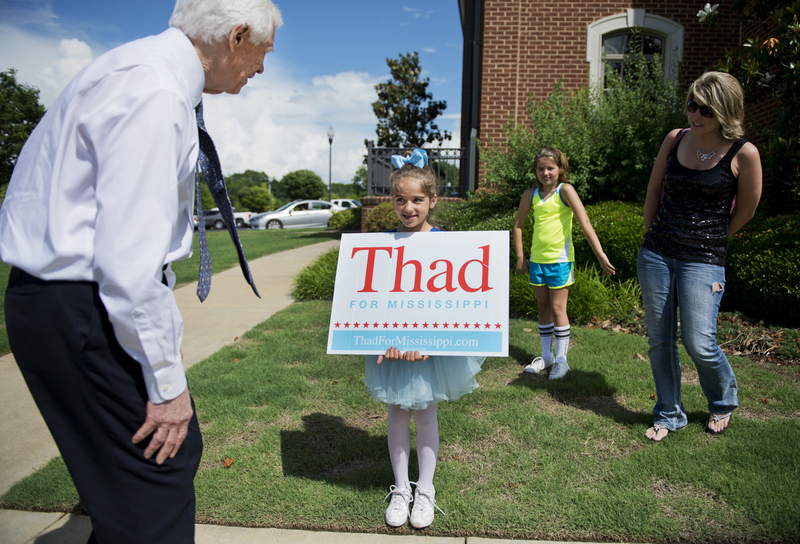 Sen. Thad Cochran’s campaign finally gave us his schedule a day in advance, and we were able to follow him to a few events. At each of the four stops we covered with Cochran, there were about six teenagers with signs that the campaign had arranged to have on hand to greet the senator’s bus. The same teenagers were at every stop. They also stood behind him during TV interviews to form a background. I initially took photos of that scenario, before I decided I wanted more candid pictures. This girl outside of Olive Branch City Hall was separate from the sign-holding crew. Although the senator was ushered over to her by an aide, she’s too cute and it made a good shot. The senator did quick tour near the Hernando town square with the mayor. The mayor brought him into a restaurant and joked that they would just go into the dining room and would stay out of the bar. 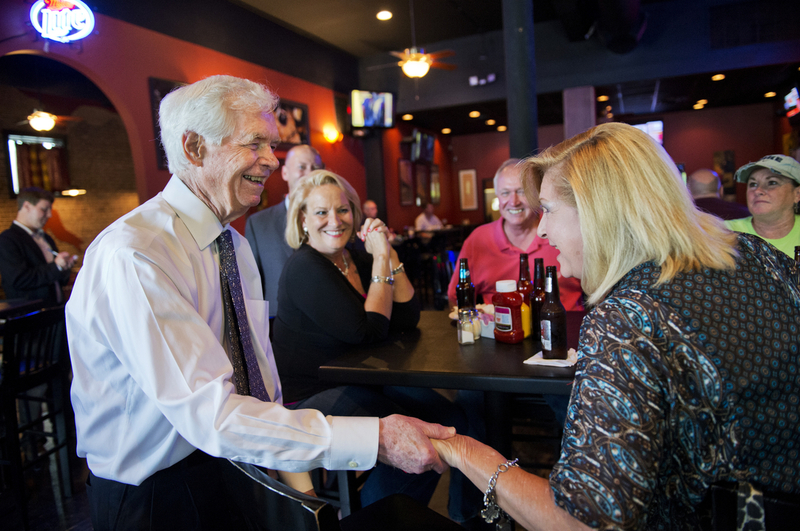 The dining room was empty but cheers came up from a table of patrons in the bar, so Cochran had no choice but to go in and greet them. It ended up being a completely innocent picture. I usually like to do some still life type photos with my phone, but I’m a little overzealous about pulling the car over when I’m on the road. On my last trip through West Virginia, I stopped the car multiple times so I tried to make sure Kyle didn’t have to sit through that. 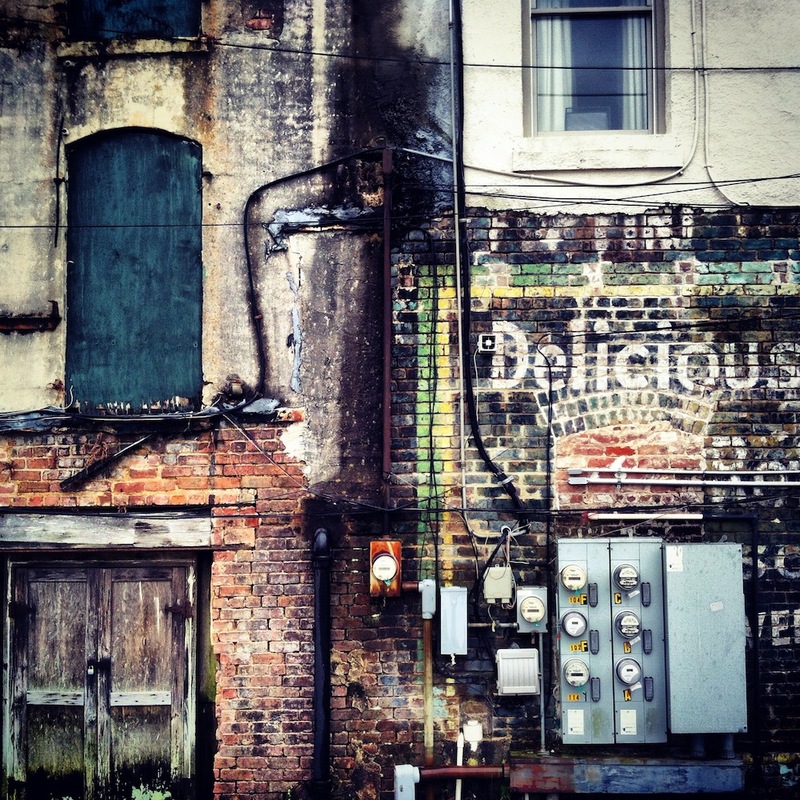 I chose to post this picture of a building in McComb on Instagram because I like the building on the left. This was the rest of the sign. 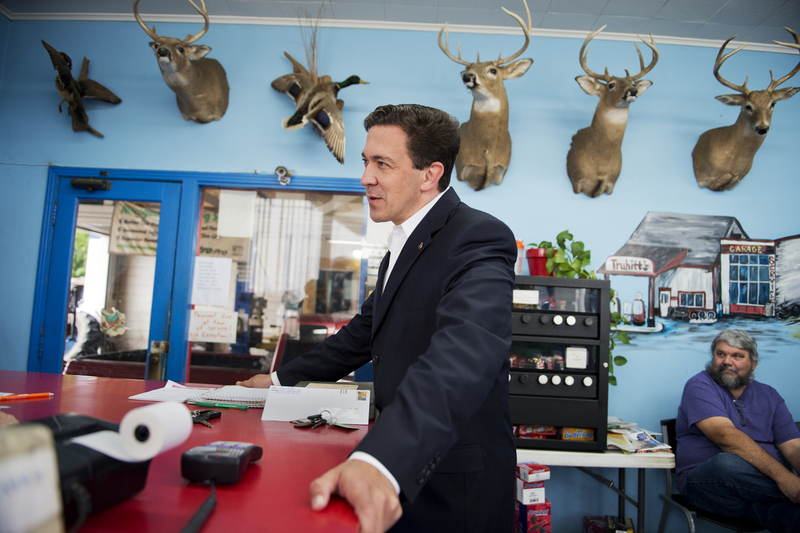 For more coverage of the Mississippi primaries, visit the At the Races blog .